A day visit by cruise ship to Antigua (St. Johns) on Feb. 3, 2012, rendered some new items of interest. 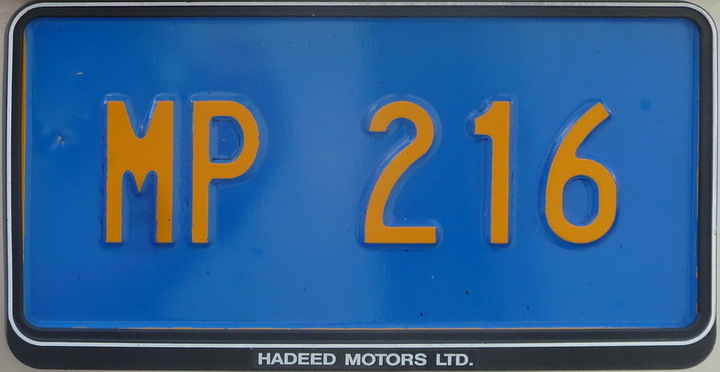 These changed to US-dimensioned, pressed plates, thought to be in annually-varying colours, which showed the abbreviation DL, followed by the initials of the Dealership (LR for Land Rover), and then a serial number. 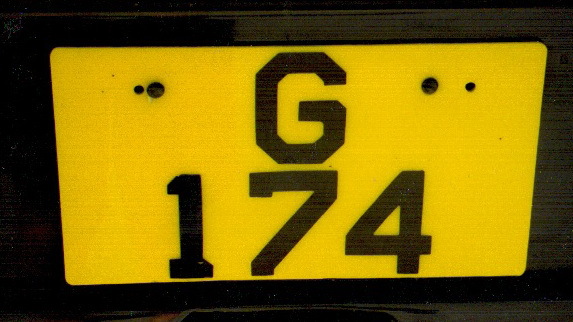 2012 sees another Trade Plate change, with a complex all-silk-screened design, printed black, green and green on a white backgrounded US-size plate as shown below. 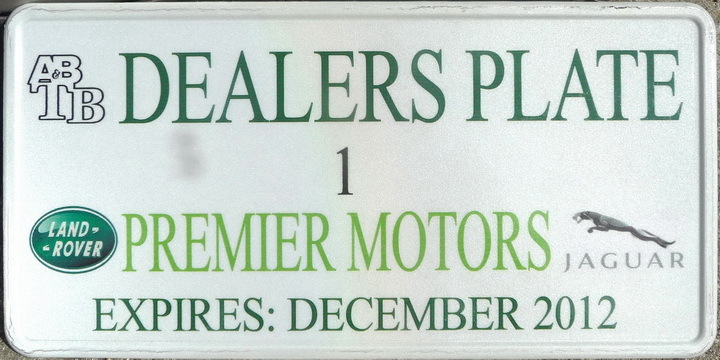 This dealer, Premier Motors, has plates 1, 2 and 3 for their use. This plate is un-drilled, as it is displayed loose from inside the vehicle, through the front or rear window. 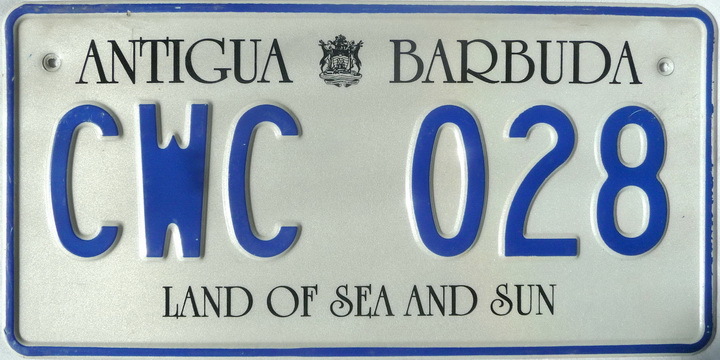 In 2007, Antigua hosted a round of the World Cup Cricket series, and the authorities issued a batch of commemorative plates for the most important participants/ distinguished visitors. 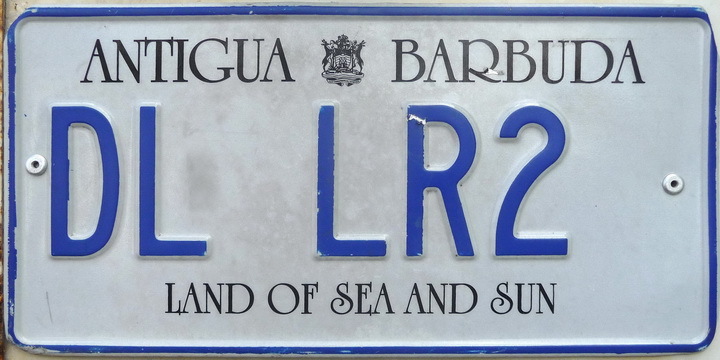 I don’t think they remain valid for Antiguans to use, but this plate survived for the pleasure of Europlate members! (Update) CWC 028 was among those to pass through the Europlate Easter auction at Trezzo and is now in the hands of a keen collector. Cricket World Cup Commemorative 2007. Current government plates for senior people are in a very pleasing colour combination of green on dusky yellow. Ministers have yet another series, without any legends, in yellow on royal blue, MP and a low serial. Antigua Government personnel from 2000, pictured 2012. 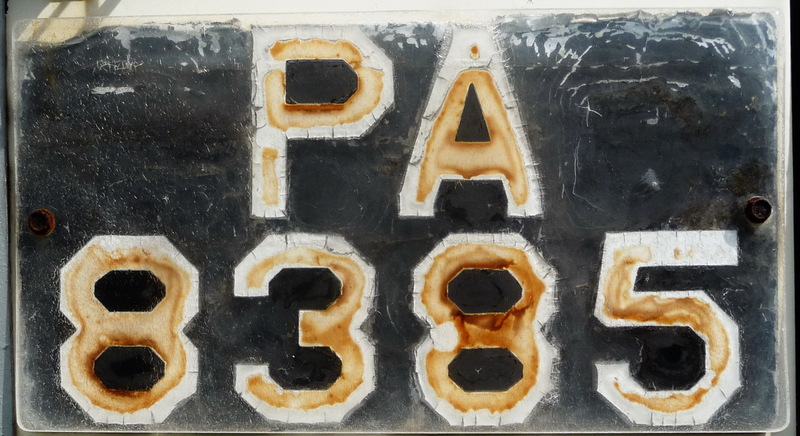 None of the old AG prefix plates remain, though I did see one of each ‘P’ and ‘PA’ , which were subsequent issue, on scrapped cars. 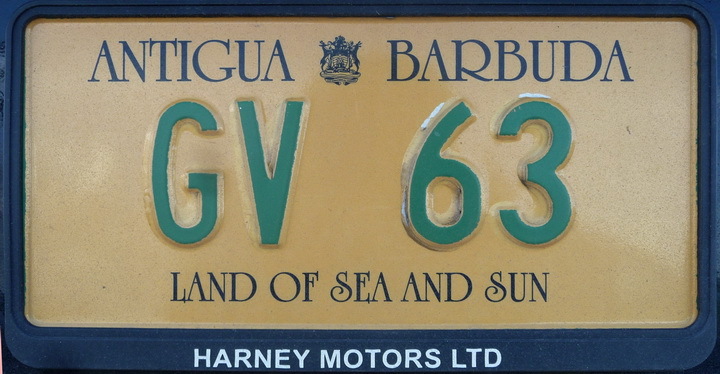 Until 2000, when the new, US-style series began, Antigua often used a characteristic letter style, which helped to separate them from the identical ‘P’ registrations issued by neighbouring islands in the West Indies and elsewhere. They made up the digits with straight lines replacing the curves of numbers and letters. 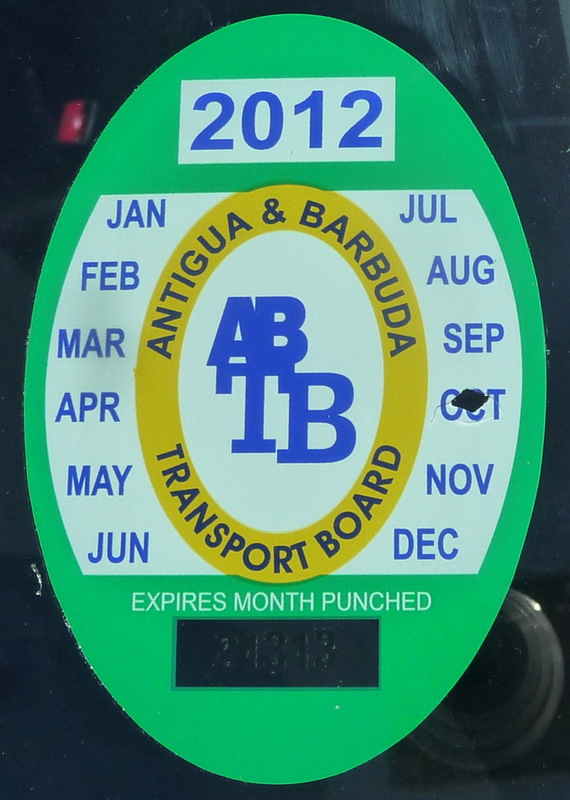 Antigua Government vehicle, pre-2000, with stylised digits. An excellent visit, where we found the Antiguans to be most hospitable and cheerful – and no grim looks when they see us photographing licence plates! Members may know that we risk being arrested in many places these days, as we go for that special shot! This entry was posted on Saturday, March 17th, 2012 at 12:35 pm and is filed under Dealer, Historic, vanity/special issue, Windward Is..	You can follow any responses to this entry through the RSS 2.0 feed. You can leave a response, or trackback from your own site.